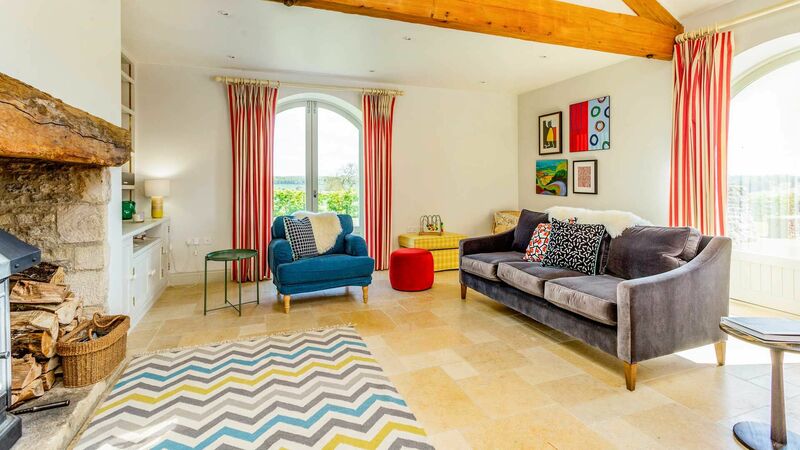 If you are longing for a real escape from it all, then look no further than Oldbury Barn. The barn’s location could not be more idyllic, tucked away in the most beautiful countryside not far from the buzz of Cheltenham. The large open plan kitchen & living area overlooks the surrounding countryside and the terrace really makes the most of the stunning views. 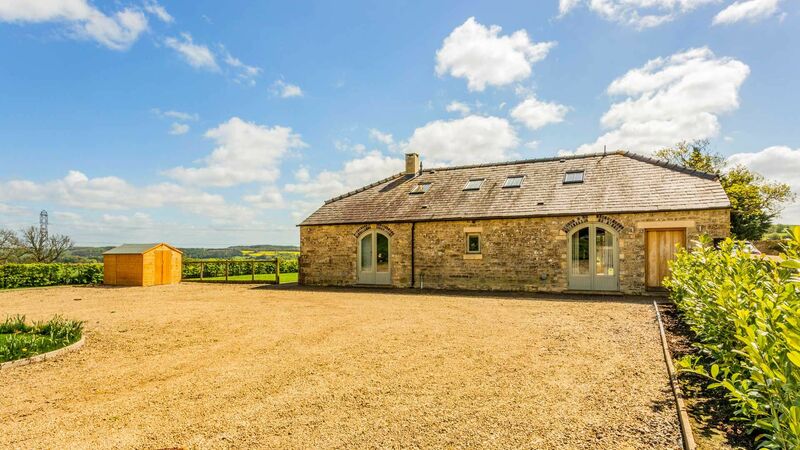 The barn has been finished to a high standard, offering accommodation for up to 10 guests in 4 comfortable and modern bedrooms. It is ideal for families, with a large child friendly garden and we can provide a travel cot and high chair free of charge on request. Double height open plan kitchen/living area with underfloor heating, beams and views across the surrounding countryside. Velux windows really flood the space with light. Guests are welcome to use the DAB radio and SONOS wireless speakers. There is no TV but you can stream programmes on a laptop or tablet as there is great WiFi. The kitchen is well stocked with everything you would need including 2 x fridges, freezer, range cooker and dishwasher. The dining table can seat 8 and in the living area, the sofas are arranged around the feature fireplace with wood burner. Hallway with boot racks and coat hooks, plus downstairs cloakroom. There is a utility room upstairs with washing machine, tumble dryer and iron/ironing board. Master bedroom - King size bed, wardrobes and en-suite bathroom. Doors open out onto the garden. Bedroom 2 – King size bed and en-suite shower room. Bedroom 4 – Double bed and Velux window with views of the garden and countryside. A single camp bed can be added to this room to accommodate a child for an additional charge. Family bathroom with shower over the bath and heated towel rail. Large terrace with outdoor sofa, table & chairs and BBQ - the perfect place to relax and enjoy the views! Children’s slide/swing set and sand pit, plus large lawn and paddock. Plenty of private parking on the large gravel drive. Fantastic house, hosts were very easy to deal with and quick to respond to requests. Our entire experience couldn’t have been better. Lovely place to stay in the Cotswolds! Fantastic house perfect for a big family. Slight issue with the heating at the start of the stay but the team were very quick to respond and sort it out. Flexible check in time meant we could really make the most of our stay. Thank you. Great secluded location for a relaxing getaway. The barn was great for socialising. I stayed here with 7 friends for a much needed catch up, incorporating a double baby shower celebration. We couldn't have wished for a nicer place to stay. The house is stunning, yet very homely and relaxing. It was supremely comfortable and well stocked with everything we needed. The setting is gorgeous with gently rolling green Cotswold fields all around, a real chance to unwind from the bustle of normal life. I wholeheartedly recommend this as a wonderful place to stay. We are residents of the US who wanted to experience the Cotswolds with our daughter and family. This house was perfect. The grounds and exterior were like taking a step back in time, however the house interior has been painstakingly restored with amazing attention to detail.. Look out massive windows at the countryside and watch the sheep grazing. It takes you back to the 1300’s. Once inside curl up in front of the wood burning stove and unwind. Inside and out it’s a beautiful experience..
Prices stated are based on an occupancy of up to 8 guests. An additional supplement of £75 per person will be applied, up to the maximum occupancy of 10. The surrounding countryside is beautiful and there are plenty of walks from the doorstep. The barn is not far from Cheltenham, Gloucester and Cirencester, so plenty to explore! In the next village you will find a pub and petrol station with shop.